We are widely recognized for providing a wide array of high quality Core And Mould Shooter Horizontal Parting Line. 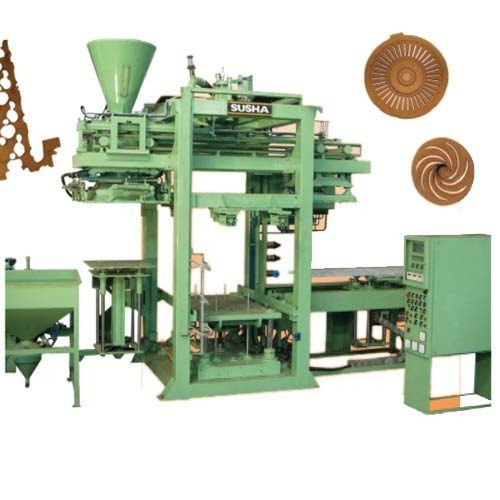 The offered machine is manufactured using optimum grade components and latest technology by our adroit professionals. This machine is extensively used for making cores, provides fully automatic operation and and is highly appreciated for its superior functionality. for easy removal of cores. Ejector mechanism in top to clean the shooting holes through top core-box. Fully automatic in operation as well individual operation by manual controls. Complete with electrical control panel having P.LC. voltmeter, three ammeters, timer for sand feed, curing, time delay relays, control circuit transformer etc. Main isolater-switch, air brake contectors, MCB, proximity switch, automatic temperature controllers, compensating cable, thermo- couple etc. Temperature control for core-box loose piece. Pneumatic system consisting of filter with regulator and in-line oil-lubricator, regulator for blow, dust gun, spray gun, pressure guages, pneumatic - cylinders, solenoid valves etc. This Mechanism is useful for operating the loose-pieces in the Core-Box. It is operated by a pneumatic cylinder of core box. Ram and Top ejection operated by Hydraulic Cylinder. In 2440 HPA it is standard. Pneumatic Sand Feed to convey sand to the top hooper of the machine. Sand Feed Hooper capacity 500 kg. Incorporated in the year 1958, we “Susha Founders & Engineers” are instrumental in providing best in class Shell Core Shooters, Low Pressure Die Castings, Gravity Die Castings, Shell Moulding, Hot Box Core Shooters, etc. Our complete product range is manufactured with the help of well tested raw material that is sourced from the genuine vendors of the market. Our offered products are manufactured using sophisticated technology under the fruitful directions of our skilled professionals. These products are valued for the features like precise design, easy installation, dimensional accuracy and durability. Our complete product array finds wide usage in numerous industries and is also provided in customized options as per the variegated needs of the clients. We have always considered quality as the foremost aim of our company. Hence, we assure our valued clients that the offered products are perfect on counts of design, durability and quality. Our valued clients can avail these qualitative accessories from in bulk quantity and at genuine rates.